Con Dao’s Prisons and Tiger Cages – travelographie. Last Christmas, I traveled the tiny island of Con Dao off Vietnam’s southern coast, where I somehow managed to unwittingly fly straight into a typhoon. After the storm passed, I explored the island’s notorious network of prisons. 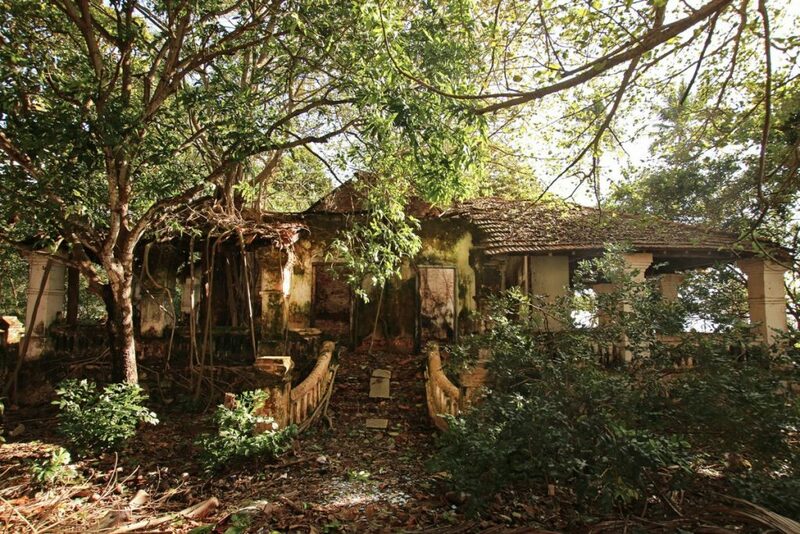 From 1862–1975, Con Dao was France’s, and then Vietnam’s penal colony in the South China Sea, and today, the ruins coexist peacefully alongside markets and homes and schools. Here’s an entry on off-hand discoveries, official histories, and the infamous tiger cages of Con Dao. The Vietnamese archipelago of Con Dao is only about 200 kilometers from mainland Vietnam, but it feels much more remote. 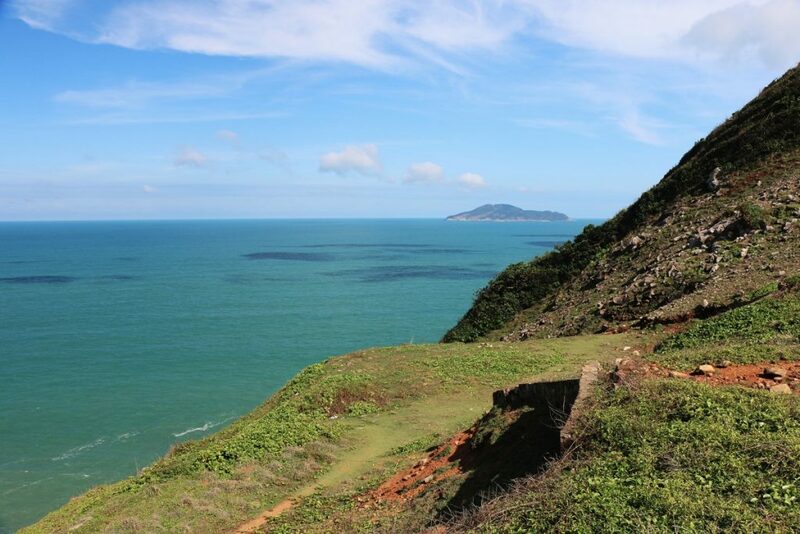 The rocky, heavily forested island hardly gets any travelers, making Con Dao a good place for those who want to get a feel for how Vietnam might have been decades ago. But just one generation ago, this island paradise was one of the most brutal penal colonies in Southeast Asia. There’s hardly any traffic on the streets of Con Dao, and the only town on the tiny island is small enough that everyone seems to know each other. The day begins early, at 6am, when loudspeakers awaken the locals with tinny announcements and revolutionary music. Everyone on the island seems to meet at the local morning market to grab breakfast and by mid-morning, everything settles down as the heat of the day rolls in. Things pick back up again as the heat dissipates at sunset, as fishermen lay anchor for the night and haul their catch to the evening market. After dark, families stroll the town’s beachside promenade, snacking on barbecued seafood. The dramatic cliffs and green seas of Vietnam’s Con Dao island. This idyllic island was once a notorious penal colony. There are just a handful of hotels and restaurants on Con Dao, and it looks like it’s going to stay that way for now. Not because the tropical paradise isn’t alluring. For one, the runway of Con Dao’s teeny-tiny airport is too short to land anything other than small turboprops. More importantly, though, Con Dao serves Vietnam as a military foothold against the Chinese in the much-disputed international waters of the South China Sea, and there are thousands of Vietnamese soldiers stationed here (we saw the military in action as they prepared the island for an impending typhoon we unwittingly flew straight into). For these reasons, Con Dao has yet to endure the unsightly development plaguing so much of the coasts elsewhere in Vietnam and Southeast Asia. For the intrepid visitor, it’s as good an island paradise as any. In a previous life in a not-so-distant past, though, Con Dao was a notorious penal colony known as “Devil Island” of Indochina. 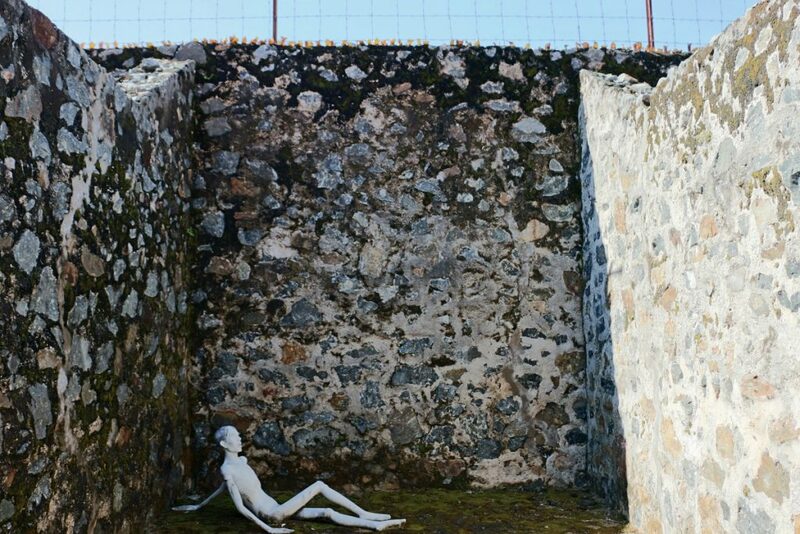 The ruins of colonial-era French villas and prisons are scattered throughout the main town, testament to an estimated 22,000 prisoners who were murdered here from 1862–1975. This was what I wanted to learn more about when I decided to visit Con Dao. 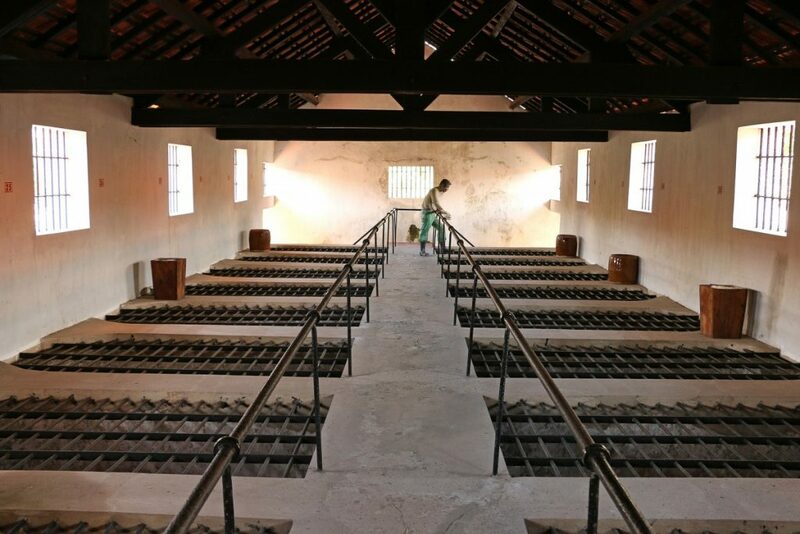 The French colonists built Con Dao’s first prison in 1862 to house colonial subversives already dreaming of an independent Vietnam more than a century before independence would be achieved. The island is well suited as a penal colony: surrounded by shark-infested, choppy waters and rocky cliffs, there is no way off, and the archipelago is small enough that even if a prisoner had managed to escape, it wouldn’t have be long until he (or she) were caught or succumbed to the elements. 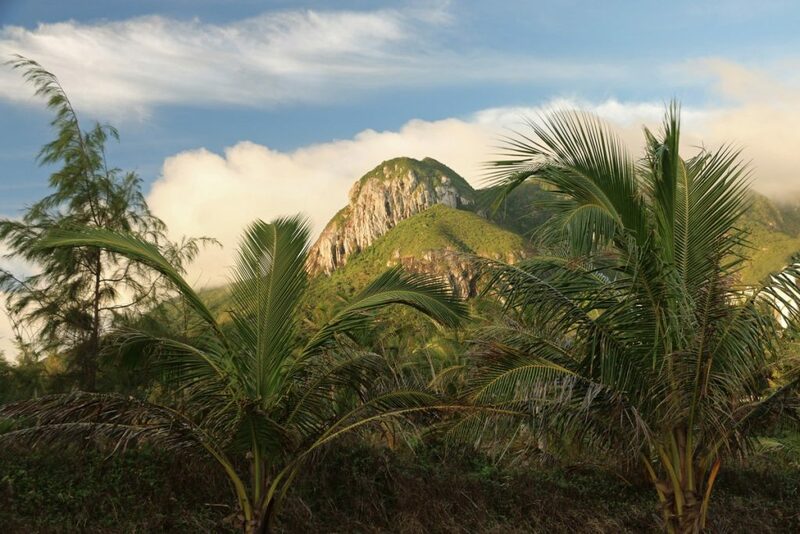 The mountainous peaks and thick foliage of Con Dao. As tensions with Vietnamese nationalists rose to an undeniable clamor in the 1940s, the French built the so-called “tiger cages” in an effort to quash the growing anti-colonial, independence movement with intimidation and force. 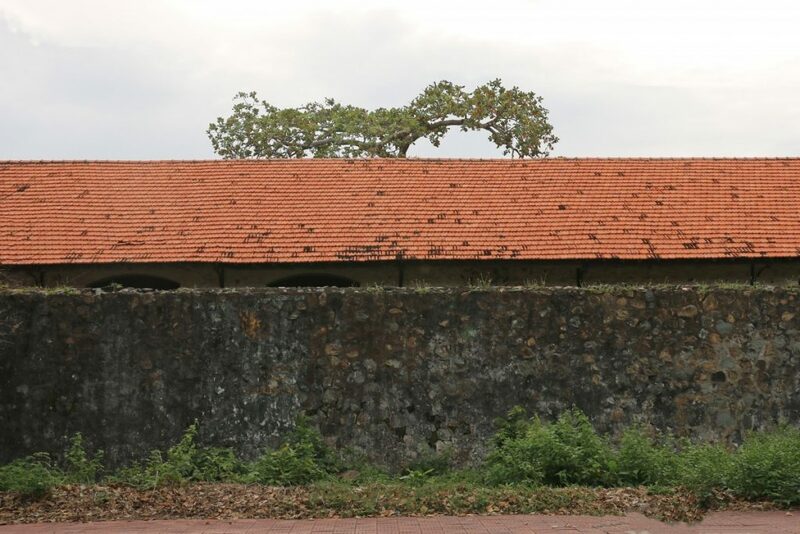 The name of the prison cells is already pretty revealing about colonial attitudes of the French towards the Vietnamese – the colonial subject was apparently a vicious, wild, untameable beast that was to be treated as such. After the Vietnamese defeated the French in 1954 (in the Anti-French Resistance War to the Vietnamese; the Indochine War to the French), the Vietnamese took control of the island. 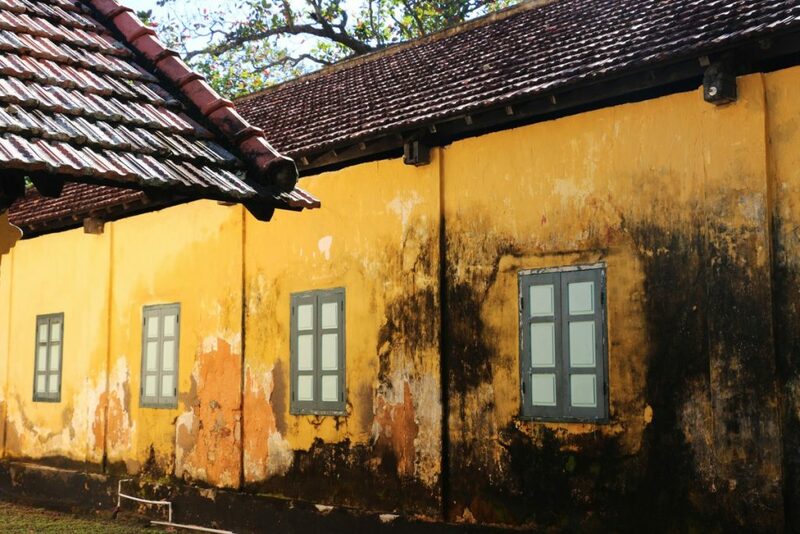 Many of the new leaders in Vietnam’s first post-colonial government had been imprisoned here by the French as subversive revolutionaries. But it wasn’t just suspected Communists who were condemned to Con Dao during this period. Potential enemies of the South Vietnamese government also included students, Buddhists, artists, journalists, and even those who refused to salute the flag. A barred window, Con Dao prison. Hushed rumors of tiger cages on an island penal colony had long been circulating in the region, but firm confirmation of these practices first reached the West in 1970. 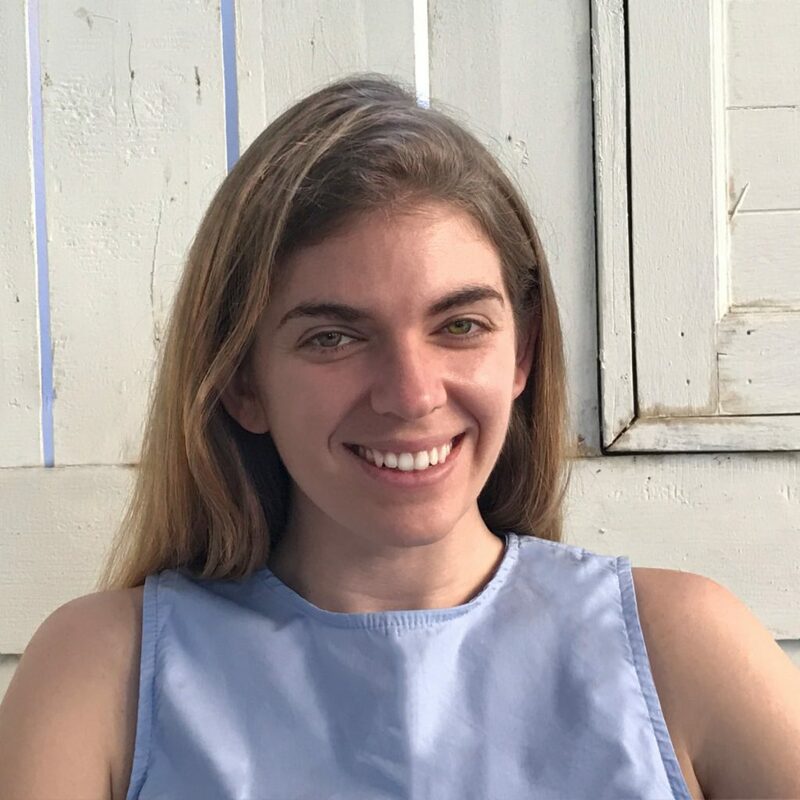 American Tom Harkin had been working as a U.S. congressional aide in Saigon, where he contacted Vietnamese journalist and translator Don Luce to learn more about the young Vietnamese student protestor movement. Luce introduced Harkin to some leaders of the student movement who had been imprisoned on the island. One survivor drew Harkin a map to the tiger cages. Harkin then convinced the congressmen he was working with to travel to Con Dao on a fact-finding mission. Once there, Harkin stole away from the official delegation and followed the map to the tiger cages, where he encountered over 500 prisoners living in miserable conditions, more than half of whom were women. They called out for water to him in French. Some of the prisoners were terribly wounded: missing fingers, cracked skulls, gaping sores at their shackled ankles. Harkin photographed what he had seen, and his images of the atrocity were published in Life magazine in 1970. Con Dao’s prisons, however, weren’t closed until the war ended in 1975. This story has an interesting postscript: after departing Con Dao, Harkin was pressured by US government officials to turn over his film. 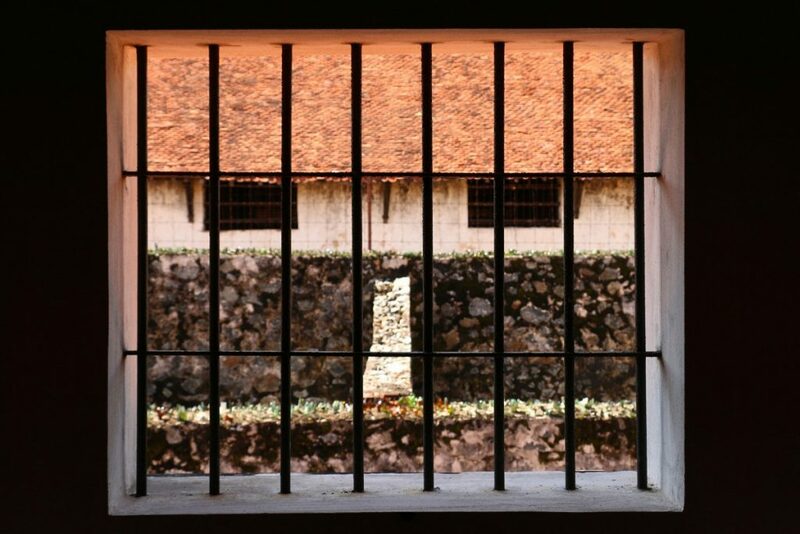 He refused, suspecting that it would be destroyed: South Vietnam’s government was in charge of the prison, and an official ally of the US government in its efforts against Communist North Vietnam. He lost his job over the publication of these photographs, learning the hard way that only certain facts are supposed to be found on an official fact-finding mission. Particularly when the facts cast an ally in an unflattering light. Today, Harkin is a US senator from Iowa. A non-descript, colorful facade of one of the prisons on Con Dao. As we paid the entrance, the museum staff member warned us that we would be locked in if we didn’t make sure to leave by the posted closing times. His warning seemed to elongate the shadows falling from the high brick walls of the prison. We walked along the shadowy pathway, gravel crunching noisily at our feet, not quite sure what we were looking at yet. Then we came upon the first building and went inside, climbing up an inconspicuous set of stairs. These were the infamous tiger cages. Unlike a “typical” prison cell, a tiger cage only has bars on the ceiling, and the walls are solid concrete. This allowed the guards to monitor and torture the prisoners from above by prodding them with long sticks through the barred ceiling (as a vicious zookeeper might poke at a captive animal). Prisoners were doused from above with quick lime, which blinded and burned them. The tiger cages of Con Dao’s. Prisoners were kept in the cells below, and guards kept their brutal watch through the barred ceilings. The tiger cages are only about 5 feet wide by 8 feet long, and each cell housed 3-5 prisoners. Prisoners were shackled at the ankle to a metal pole that could only be opened from the outside of the cell. The prisoners were kept naked in the cells. They suffered from TB and sores that never healed and intestinal diseases. They were starved and tortured with thirst. The tiger cages are located in the building to the right, while the open-air torture chambers are to the left. The concentration of suffering in the tiger cages is unfathomable. The deeper you force yourself to imagine, the harder it becomes to find a way back to the surface. A view inside one of the tiger cages of Con Dao. 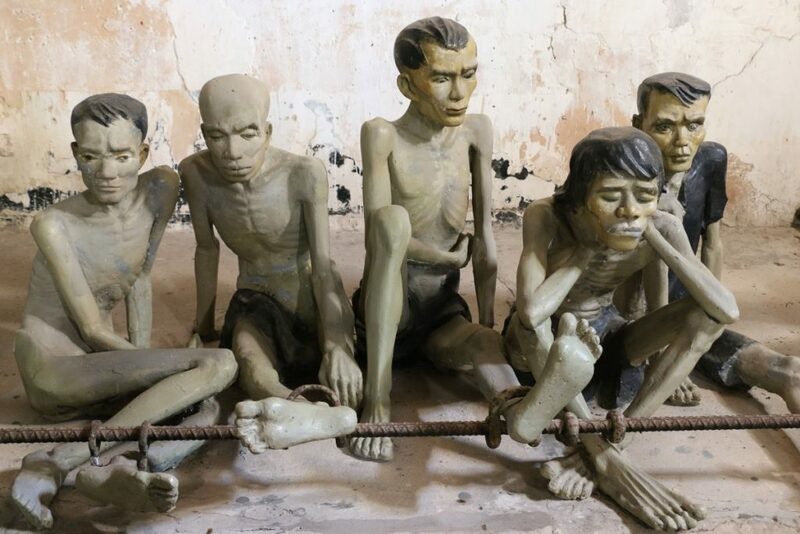 I wonder if that’s why the museum had done some of this imagining for the visitors – by providing statues depicting the prisoners, eternally posed in one frame of their suffering. 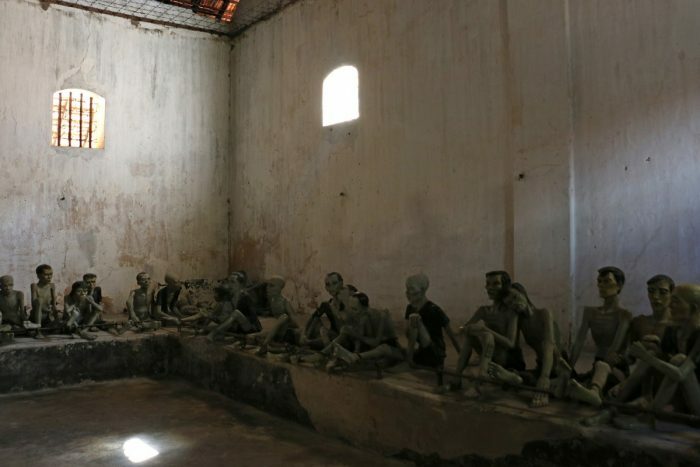 I can’t recall ever having seen a museum of atrocity like this – where the sufferers were represented as life-sized diorama models against the real-life backdrop. Photos or drawings, yes, but not actual models filling the empty space where the prisoners once were. The figures are slightly off scale – despite their emaciated depiction, the statues are perhaps 75% of the size of a real human. Even stranger, their faces are molded in subdued expressions of sadness, boredom, or listlessness, maybe even remorse. Not the agony or exhaustion or fury or despair I had been imagining. 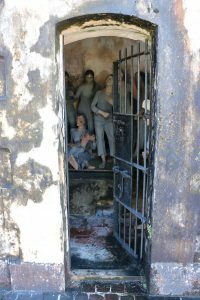 The subdued expressions of the statues depicting prisoners at the Con Dao prison. Humans do manage to adapt to the most horrific of circumstances: it’s impossible for anyone to survive long in a state of agony or exhaustion or fury or utter hopelessness. But by providing this representation of the prisoners, the exhibition insists on a tempered understanding of their experience. I wondered what purpose their muted expressions were serving. These diorama-like models felt like shortcuts to provide visitors with an officially sanctioned version of this history. Bypassing the generative process of informed imagining that opens a way towards understanding, and empathy. 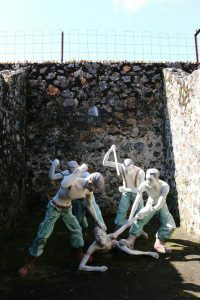 A prisoner being tortured in one of the Con Dao prison’s open-air cells. This is why I lingered in the empty spaces. So I could fill them in on my own. I think this is the duty of a visitor to places like these. Opposite of the buildings with the tiger cage cells, there are rows of open-air pens. These brick cells don’t have a ceiling and were used to beat prisoners, since the tiger cages themselves were too small for that particular form of torture. Underneath an open sky, perhaps under the scorching sun in the dry season or the piercing rain of the monsoon, the prisoners were beaten or simply left for days, with no protection against the elements. After having spent months or even years in the claustrophobic containment of the tiger cages, being exposed to the vastness of the sky must have been yet another terror. Over time, the figures outside have taken on a ghostly appearance, their paint bleached off by the sun and rain. Like Greek statuary (which was originally painted in bright colors) these bleached figures too have assumed a solemnity more befitting their task of commemoration. 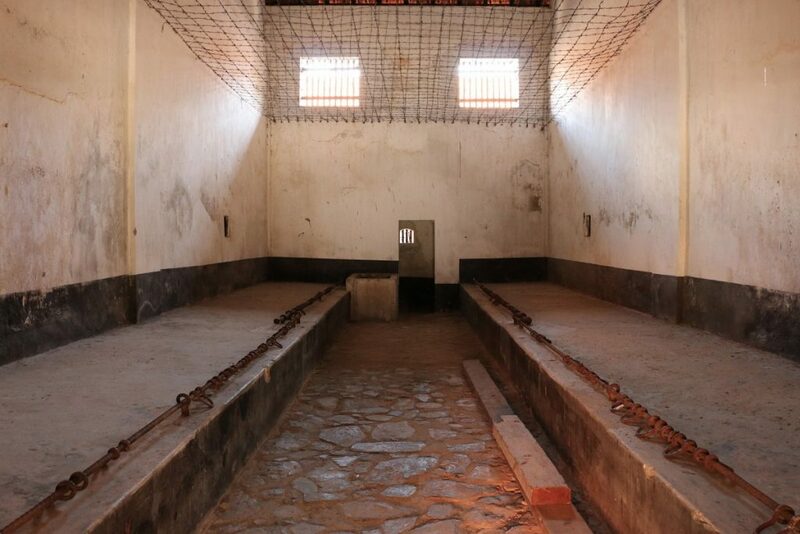 An open-air torture chamber where prisoners held in the tiger cages were beaten and tortured. The tiger cages of Con Dao are actually outside of the main prison, in a complex at the periphery of town. It’s as if the people who built the tiger cages knew just how borderline these new structures were, even in the context of the dirty work already being done in the penal colony. 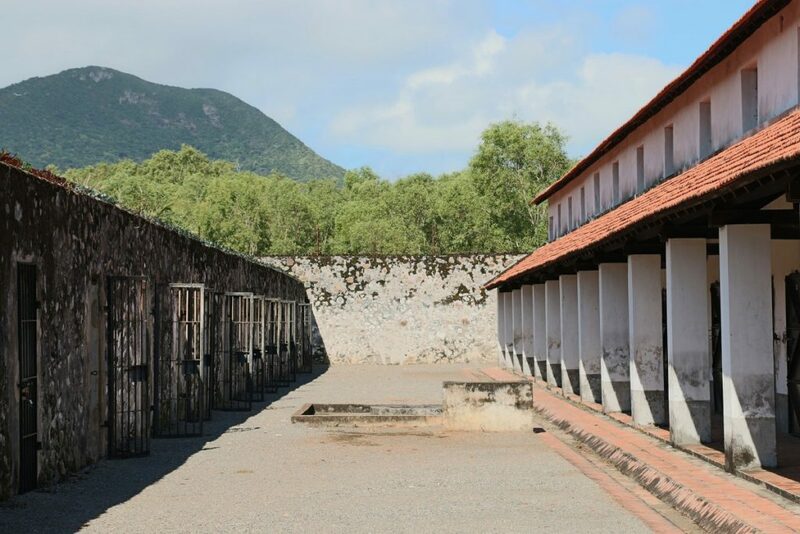 The main prison on Con Dao, which is really in the center of Con Son town, doesn’t have tiger cages. Instead, it has huge communal cells. In massive rooms, dozens and even hundreds of prisoners were shackled by the ankles to long metal bars running the length of the concrete “beds.” Here, prisoners were shackled in one long row, one after the other. It would have been impossible to even roll over. I actually found these huge rooms of the Con Dao prison even more terrifying than the tiger cages. The scale of the suffering there was hard for me to imagine. Their collective suffering must have hung in the air like an oppressive humidity, weighing down on every breath. Every twitch, gasp, move, cough, hunger pang, or call of nature rippled through the room. They couldn’t suffer without increasing the suffering of those around them. Their suffering wasn’t even their own. One of the large communal holding cells of Con Dao’s main prison. Last year, we’d seen the same ankle shackles at the Tuol Sleng Genocide Museum in Phnom Penh, Cambodia, where the Khmer Rouge interrogated and tortured suspected enemies of the state before executing them in the Killing Fields. Introduced by French colonists, these ankle bars shackled prisoners prostrate in nameless, hopeless rows, across centuries and regimes throughout Southeast Asia. This was one of the exports from a purported center of civilization. 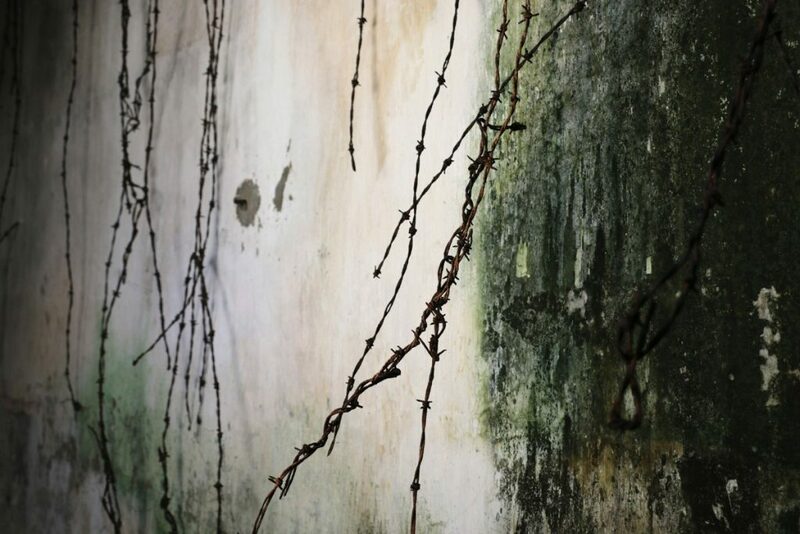 Vines of barbed wire against a prison wall, Con Dao. Maybe the strangest thing about Con Dao is how unremarkably the contemporary town coexists alongside the historical buildings of the prisons. It doesn’t seem like there had been much effort to dismantle or repurpose the buildings or distance themselves from the history. The prisons were just left standing as they were, and new buildings sprang up around and across and next to them. In the west, these kinds of places typically get set apart. They become memorials, hallowed spaces distinct from the settings of everyday life. Or, they are forgotten, maybe commemorated with little more than a metallic plaque, tended by survivors or their families until that generation passes away. This is something I feel like I keep seeing in Southeast Asia. The past isn’t relegated to a sanctified space or some forgotten corner. It’s still right next door, right across the street. Just over the prison wall. Maybe this is what allows these cultures to have such a future-looking orientation. In the West, the past is something you always have to work through before you can move on. In the East, it’s something you just have to live with. Either way, though, there’s no escaping it. A tree growing inside the prison, over the prison walls. Don Luce, “The Tiger Cages of Viet Nam,” https://www.historiansagainstwar.org/resources/torture/luce.html. Humberto Sanchez, “Tom Harkin – From Tiger Cages to Pinochet,” https://www.rollcall.com/news/tom-harkin-human-rights-legacy-began-in-a-tiger-cage. Sylvan Fox, “4 South Vietnamese Describe Torture in Prison ‘Tiger Cage,'” http://www.nytimes.com/1973/03/03/archives/4-south-vietnamese-describe-torture-in-prison-tiger-cage-center-of.html.